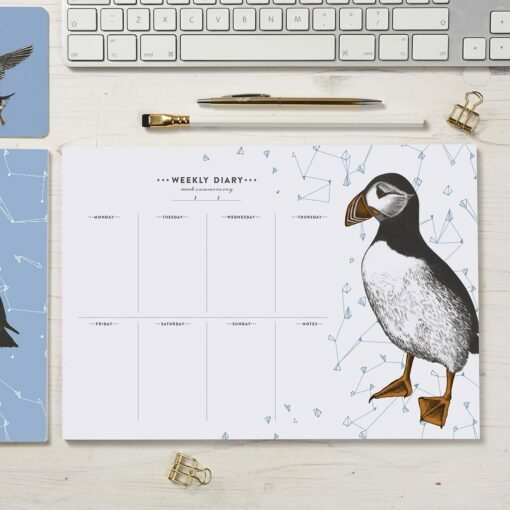 Perfect for meal planning or as a study time-table, our weekly planner featuring the Atlantic puffin contains 50 tear-off sheets, you can also customise the dates too for whichever ever week you are planning for. Printed in cool blue, jet black and bright orange we’ve combined our illustration of Britain’s favourite seabird with a funky geometric pattern. Whether stuck onto the fridge or kept in the office, it is super functional as well as pretty to look at! The pad is A4 in size and comes packaged in a clear protective wrap.